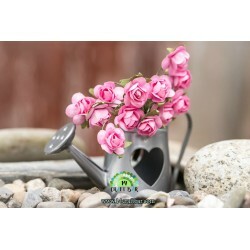 Handmade Rose Paper Flower available only in 12 pcs bunch !!! Color : MINT (See Photo) Material: Mulberry Paper Measurements - Flower Size: ¼” or 1 cm. 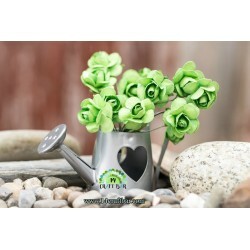 - Green Wire Stem Length: 1 ½” or 4 cm. Handmade Rose Paper Flower available only in 12 pcs bunch !!! 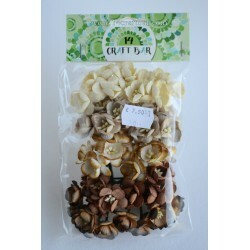 Color : GREEN (See Photo) Material: Mulberry Paper Measurements - Flower Size: ¼” or 1 cm. 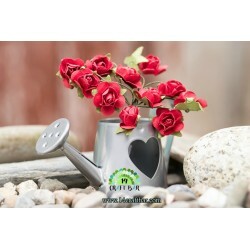 - Green Wire Stem Length: 1 ½” or 4 cm. Handmade Rose Paper Flower available only in 12 pcs bunch !!! Color : BURGUNDY (See Photo) Material: Mulberry Paper Measurements - Flower Size: ¼” or 1 cm. 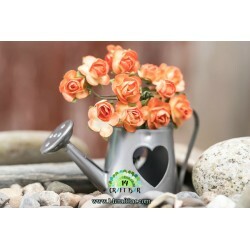 - Green Wire Stem Length: 1 ½” or 4 cm. 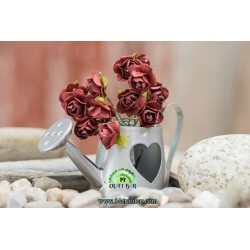 Handmade Rose Paper Flower available only in 12 pcs bunch !!! 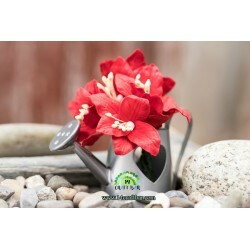 Color : RED (See Photo) Material: Mulberry Paper Measurements - Flower Size: ¼” or 1 cm. 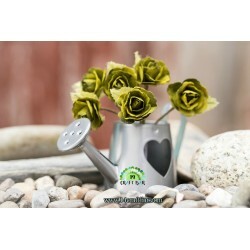 - Green Wire Stem Length: 1 ½” or 4 cm. 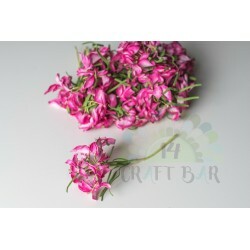 Handmade Rose Paper Flower available only in 12 pcs bunch !!! Color : CORAL (See Photo) Material: Mulberry Paper Measurements - Flower Size: ¼” or 1 cm. - Green Wire Stem Length: 1 ½” or 4 cm. 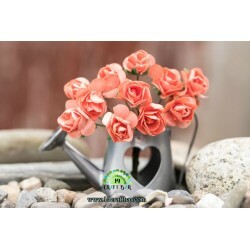 Handmade Rose Paper Flower available only in 12 pcs bunch !!! 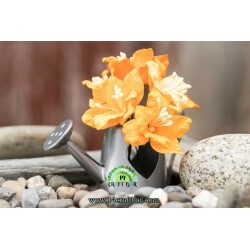 Color : ORANGE (See Photo) Material: Mulberry Paper Measurements - Flower Size: ¼” or 1 cm. - Green Wire Stem Length: 1 ½” or 4 cm. Handmade Rose Paper Flower available only in 12 pcs bunch !!! Color : YELLOW (See Photo) Material: Mulberry Paper Measurements - Flower Size: ¼” or 1 cm. - Green Wire Stem Length: 1 ½” or 4 cm. 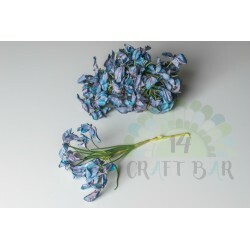 Handmade Lily Paper Flower 5 or 50 pcs -you have to choose !!! 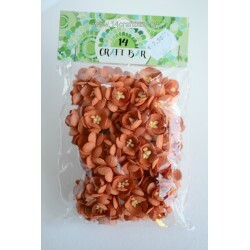 Color : ORANGE (See Photo) Material: Mulberry Paper Measurements - Flower Size: 1½” or 3.75 cm. 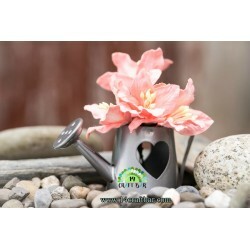 - Green Wire Stem Length: 2" or 5 cm. Handmade Cherry Blossom Paper Flowers AVAILABLE ONLY IN PACK WITH 50 PCS Color : MIX GEEN + PINK+ WHITE (See Photo) Material: Mulberry Paper Measurements - Flower Size: 1” or 2.5 cm. 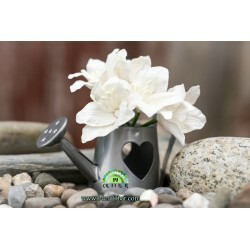 - Green Wire Stem Length: 2" or 5 cm. Handmade Cherry Blossom Paper Flowers AVAILABLE ONLY IN PACK WITH 50 PCS Color : MIX GREEN (See Photo) Material: Mulberry Paper Measurements - Flower Size: 1” or 2.5 cm. 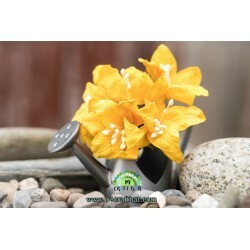 - Green Wire Stem Length: 2" or 5 cm. Handmade Cherry Blossom Paper Flowers AVAILABLE ONLY IN PACK WITH 50 PCS Color : MIX ORANGE + PINK + MINT (See Photo) Material: Mulberry Paper Measurements - Flower Size: 1” or 2.5 cm. 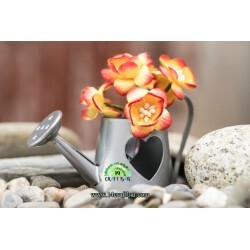 - Green Wire Stem Length: 2" or 5 cm. Handmade Cherry Blossom Paper Flowers AVAILABLE ONLY IN PACK WITH 50 PCS Color : MIX ORANGE + DARK COLORS (See Photo) Material: Mulberry Paper Measurements - Flower Size: 1” or 2.5 cm. - Green Wire Stem Length: 2" or 5 cm. Handmade Cherry Blossom Paper Flowers AVAILABLE ONLY IN PACK WITH 50 PCS Color : SHADED CREAM+BURGUNDY (See Photo) Material: Mulberry Paper Measurements - Flower Size: 1” or 2.5 cm. - Green Wire Stem Length: 2" or 5 cm. Handmade Cherry Blossom Paper Flowers 5 or 50 pcs -you have to choose !!! Color : BURGUNDY (See Photo) Material: Mulberry Paper Measurements - Flower Size: 1” or 2.5 cm. - Green Wire Stem Length: 2" or 5 cm. Handmade Cherry Blossom Paper Flowers 5 or 50 pcs -you have to choose !!! 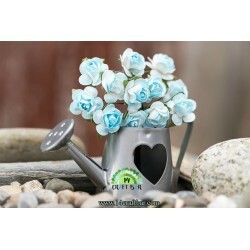 Color : BLUE (See Photo) Material: Mulberry Paper Measurements - Flower Size: 1” or 2.5 cm. - Green Wire Stem Length: 2" or 5 cm. Handmade Cherry Blossom Paper Flowers 5 or 50 pcs -you have to choose !!! 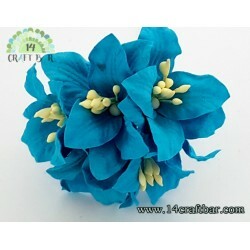 Color : TURQUOISE (See Photo) Material: Mulberry Paper Measurements - Flower Size: 1” or 2.5 cm. - Green Wire Stem Length: 2" or 5 cm. Handmade Cherry Blossom Paper Flowers 5 or 50 pcs -you have to choose !!! Color : MINT (See Photo) Material: Mulberry Paper Measurements - Flower Size: 1” or 2.5 cm. - Green Wire Stem Length: 2" or 5 cm. Handmade Cherry Blossom Paper Flowers 5 or 50 pcs -you have to choose !!! Color : LIME GREEN (See Photo) Material: Mulberry Paper Measurements - Flower Size: 1” or 2.5 cm. - Green Wire Stem Length: 2" or 5 cm. Handmade Cherry Blossom Paper Flowers 5 or 50 pcs -you have to choose !!! Color : FUCHSIA (See Photo) Material: Mulberry Paper Measurements - Flower Size: 1” or 2.5 cm. - Green Wire Stem Length: 2" or 5 cm. Handmade Cherry Blossom Paper Flowers 5 or 50 pcs -you have to choose !!! Color : PINK Material: Mulberry Paper Measurements - Flower Size: 1” or 2.5 cm. - Green Wire Stem Length: 2" or 5 cm. Handmade Cherry Blossom Paper Flowers 5 or 50 pcs -you have to choose !!! Color : PALE PINK (See Photo) Material: Mulberry Paper Measurements - Flower Size: 1” or 2.5 cm. - Green Wire Stem Length: 2" or 5 cm. Handmade Cherry Blossom Paper Flowers 5 or 50 pcs -you have to choose !!! Color : PEACH (See Photo) Material: Mulberry Paper Measurements - Flower Size: 1” or 2.5 cm. - Green Wire Stem Length: 2" or 5 cm. Handmade Cherry Blossom Paper Flowers 5 or 50 pcs -you have to choose !!! Color : RED (See Photo) Material: Mulberry Paper Measurements - Flower Size: 1” or 2.5 cm. - Green Wire Stem Length: 2" or 5 cm. Handmade Cherry Blossom Paper Flowers 5 or 50 pcs -you have to choose !!! Color : SHADED YELLOW + RED (See Photo) Material: Mulberry Paper Measurements - Flower Size: 1” or 2.5 cm. - Green Wire Stem Length: 2" or 5 cm. Handmade Cherry Blossom Paper Flowers 5 or 50 pcs -you have to choose !!! Color : ORANGE (See Photo) Material: Mulberry Paper Measurements - Flower Size: 1” or 2.5 cm. - Green Wire Stem Length: 2" or 5 cm. Handmade Cherry Blossom Paper Flowers 5 or 50 pcs -you have to choose !!! Color : SHADED ORANGE (See Photo) Material: Mulberry Paper Measurements - Flower Size: 1” or 2.5 cm. - Green Wire Stem Length: 2" or 5 cm. Handmade Cherry Blossom Paper Flowers 5 or 50 pcs -you have to choose !!! 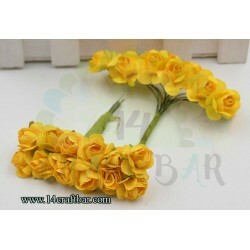 Color : YELLOW (See Photo) Material: Mulberry Paper Measurements - Flower Size: 1” or 2.5 cm. - Green Wire Stem Length: 2" or 5 cm.